"A cookie crust holds three chocolatey layers for a creamy no-bake pie." Finely crush 24 of the cookies; mix with butter. Press firmly onto bottom and up side of 9-inch pie plate. Spoon 1-1/2 cups of the pudding into crust. Gently stir 1/2 of the whipped topping into remaining pudding; spread over pudding layer in crust. Chop remaining 8 cookies; stir into remaining whipped topping. Spread over pie. 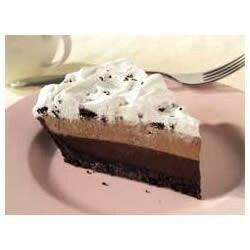 See how to make an amazingly simple, silky chocolate pie. One of the best oreo pies i have made. I used premade oreo pie crusts instead of making my own because it makes 2 pies instead of one. This is always the favorite at our monthly family BBQ's!